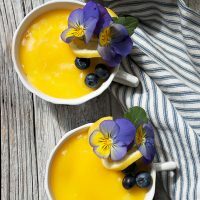 Pretty, easy and delicious, this dessert features no-bake cheesecake in a teacup, topped with lemon curd and decorated with flowers and fresh berries. For the Lemon Curd: In a small saucepan, whisk together the egg yolks and the whole egg until combined. Add in the sugar, lemon juice and zest and continue whisking until creamy and well incorporated, about one minute. Place the saucepan over medium heat on the stovetop. Cook, whisking constantly, until the custard thickens and can coat the back of a wooden spoon, about 8-10 minutes. (*If you have an instant read thermometer, watch for this thickening to occur around 175-180F, if you want to monitor it that way. DO NOT ALLOW THE MIXTURE TO BOIL, as it will curdle). Remove the pan from the heat and stir in the butter, one cube at a time until each is melted. Strain into a bowl, cover the surface with plastic wrap and chill in the refrigerator for at least one hour. Keep refrigerated or freeze. For the Cheesecake Filling: In the bowl of stand mixer with a whisk attachment or in a large bowl with your electric mixer, beat the whipping cream until soft peaks form. Remove whipped cream to a separate large bowl and set aside. Rinse the bowl and wipe dry. In the same bowl with your electric mixer (or with your stand mixer fitted with the paddle attachment), beat the cream cheese until smooth. Add the sugar and beat until light and fluffy. Scrape down the sides of the bowl, then beat in the vanilla extract. Remove bowl from mixer if using stand mixer. Spoon the reserved whipped cream on top of the cream cheese mixture. Using a spatula, fold the whipped cream gently in to the cream cheese mixture until well combined. Remove teacups from fridge and place a layer of filling over the chilled graham cracker crust until it reaches within 3/4-inch of the top of the cup. Smooth the top of the filling. Spoon a layer of the cooled or room temperature lemon curd over the cheesecake filling and gently spread evenly to the edges. Place teacups in the refrigerator for several hours or more. To serve, decorate with a slice of lemon, flowers and a few fresh blueberries.